I actually have a not a classic background for coworking space even though I'm not sure there's a classic background. I studied economics, my masters were in environmental and energy economics. I was always interested in the environment and sustainability. Before I came then when I came to Australia, I started working in events, always around energy then I joined Energy Lab last August. Energy Lab is launched in March. 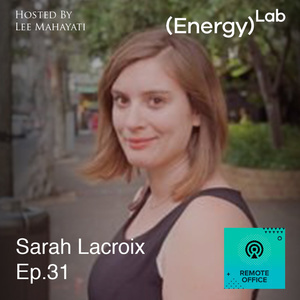 The idea of Energy Lab is really to help people want to innovate in the clean energy space. It's more about helping the energy industry which is leaving a complete revolution. We know in 50 Years, the Energy industry will look nothing like it looks like today. It's not just about climate change but it's also really a technical progress like engineering challenge. What we want to do is to help the entrepreneurs who want to disrupt this industry and make a good forward with more clean energy solutions. One of the biggest challenges of Energy industry, it's a very regulated area, you could compare it to fintech that extent. It's heavily regulated area and mainly controlled by big utilities and that's where Energy Lab is helping them. Energy Lab has partnered our main sponsor is Origin Energy which is one of the biggest utilities in Australia. Our role is to connect these entrepreneurs, these innovators with the big guys and help them work together to a brighter energy future and cleaner. Energy Lab is part of the University of Technology Sydney. Our building is in the UTS. UTS is sponsoring us, by giving us the space. It's a beautiful heritage building where we are. We don't have a workshop but we're working on it. We still like try to do cool things. We installed a small meter, for example, to track our energy usage and try to optimize it. We also used this data for like some cool projects. We don't have the specific infrastructure for prototyping cleantech product because of Energy Lab still in the building which part of the university, so it's not really up to us. Energy lab is constructed as a hub. We run the acceleration program but we also run events and we also coworking space. If you want to take part in our acceleration program, we provide seed fundings for AUD 50k to help companies get up and going. In addition to that, we were in a lot of workshops, connect them with mentors to really help them develop their idea, develop their project and take it to the next stage. Both of our founders actually our serial entrepreneurs. They meet with the startups probably like once every three weeks in a month to follow up with them, give them valuable contact. We also have a full network of people working in renewable energy in Australia— either in venture capital banking or utilities or lawyers and the oldest network— can help our members and people in our acceleration program, in particular, to reach their goals and help them with specific aspects of the projects. There's an application process. You have to apply then once you selected you can go through the acceleration program but we also offer coworking space. If you are a stage, where you already received seed funding from someone else or if your startup has been more established, you can just rent a desk from us and you still have the advantage of living in a hub. We run a lot of events, so there's always some cool people working in clean energy that pass by and you can meet them and connect. We run a few different programs. We run internship programs for students who are interested in entrepreneurship but don't know where to start and didn't get experience, so we help them get experience startup in clean energy so they can learn more about the sector and also what does it entail to do to be an entrepreneur. It's not like all pink and flowers like you can't imagine your movies, hands-on experience with this. We run hackathons as well. It's a great way for us to have people come up with ideas, innovate it and find potential cofounders if they already have an idea. At the end of the hackathons, if it's an interesting idea of course get the idea up and running and for that, we run a springboard program. The springboard program would be more of a pre-acceleration program, a tracking workshop— where we see where you are will see, where you need to go before you can apply for the acceleration program— and we help you connect with the right people and tailor or your application for later. It will bring Australia to more clean energy Australia. Hopefully, from some of the startups that came out of our acceleration program, we'll have some unicorn I hope. Bringing Australia to 100% renewable. The song is by Happy Days by Scott Holmes.